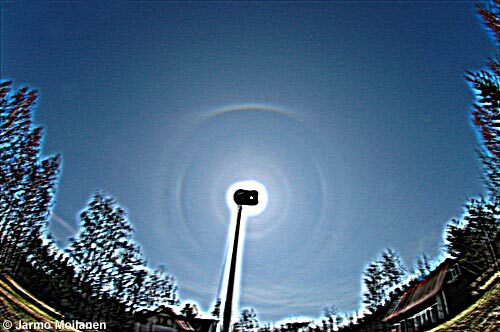 Yesterday, 6 May 2006, odd radius halos were observed in a large area in Eastern and Central Finland. Odd radius halos observed during the day were mainly circular halos and plate arcs. I photographed the display in Vaala, were it lasted for 3 hours. Photo shown here is made by stacking 24 photos which were taken during 10 minutes time. Unsharp mask has been used to show halo better. Visually halos of the display were not as clear as in this stacked photo, but all halos shown in this photo were also observed visually, except 35° halo which can be seen faintly on left. More photos are here. Jenni Holopainen in Joensuu probably got best odd radius halos during the day. Her photos can be seen here and here. Marko Mikkilä observed odd radius halos in Nivala, Teemu Öhman in Äänekoski and Eero Savolainen in Kuusankoski. Photos by Mikkilä and Savolainen can be found also here. 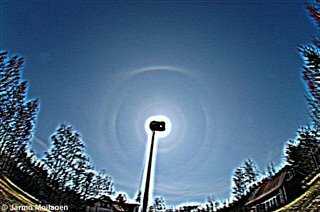 Looks like in some of the photos 9 degree halo shows column arcs to the left and right. Yeah, in Jenni's photos 9° column arcs are clear. Also, 20° halo is brightened on the sides in many photos which means 20° column arcs. Then there is upper 9° plate arc and 35° halo in her photos. We often have odd radii in high pressure situation when weather turns much warmer than the average. Now it's been really warm. Maybe there is truly more high cloud odd radii up here. Or maybe we just notice them. Many of our observers are using convex mirrors that help a great deal in spotting the rare faint halos. In this display of course there was no need for mirror to realize what's going on. The lunar displays in March and April that contained odd radii were not spectacular in many locations. You looked out from the window and hardly even saw halo around the moon. But if you decide to go out and photograph it anyway, the odd radii halos show up in the photos. Frequency increase of odd radius displays is related to above-average spring temperatures here over Holland too, I've noticed the past years. And now: we had a full 9 degs ring (with no special arcs to it) on Friday 5/5 over here, not bright but with coloration visually observed. No other odd radii were in the display. Halo acivity was high the first week of May anyway, by temperatures up to 28 degs and extremely low humidity (down to 20%). I've seen through our extensive Pyramidal-Displays and have experienced, that the most was orginated in propositional low Cirrostratus (7000-8000m). Do someone know, on which temperature originate Pyramidal Ice Crystals? And do you know something about the high of Finnish Cirrus during the Pyramidal Displays? I think Walt would be right person to comment on this. Anyway, pyramid crystals are low temperature crystals. None of the snow machine displays that are seen here in winter have produced odd radii halos sofar. It's probably too warm, those machines are not used at temperatures lower than -20° C. In South Pole there was weak odd radii in 11.1.1999 display and I think the temperature on the ground was -20° C. That's the warmest I know for the pyramid crystals. I've thumbed through our statistic, the most of Germans pyramidal halos orginated on the Cirrus-Forerunners of warm fronts in relatively low Cirrus. This contradict, that Pyramidal crystal originating to cold temperature! There is no necessarily contradiction. It can be also too cold for pyrs, at least in low level displays. Crystals get too small. Perhaps the optimum for pyrs is around -30° C.
Yeah, the pyr displays can be stable. Jarmo saw pyrs 5 days in a row in 1996. I got 3 days (almost non-stop fashion) in 1987. It's also interesting that low level displays can last long time. In Lappland there is evidence of good quality plate and column display (full parhelic circle, etc) that last continuosly for at least 48 hours.